THE ARTS COLLECTIVE Block T has announced they are leaving their workspace in Smithfield due to a lack of funding to pay rising rent bills. Comprising of 120 members and 70 creative studios and workshop facilities, Block T has been based in North Dublin for the past six years. Many art studios and workspaces have been forced to close in recent years, with collectives like Basic Space, Mabos, and The Joinery suffering as Ireland’s economy began to recover and rent prices soared. During the recession, arts collectives benefitted from utilising empty premises at bargain basement rents due to the lack of competition for these workspaces. In a statement on their website, Block T said they were disappointed at the need to relocate and called for support from “champions for Irish culture, interested patrons, [and] local TDs”. Where to next for Block T? Block T have informed their members that they will be vacating the premises and are appealing for help to find a new home. On 31 March they face eviction from their Dublin 7 base, leaving their members with nowhere to go. Speaking to TheJournal.ie, Block T’s managing director Laura Garbataviciute Dovn said the group faced its biggest challenge in the coming months. We believe we are spaces like us are integral for a healthy Irish economy. Over the years we have employed hundreds of artists for various projects, acted as a seeder company and generated millions across our members’ network working from our facilities. Garbataviciute Dovn said the support they have received proves there are people who care about the arts and she is hopeful about finding a solution. “It’s not just a financial issue, but the reality is we need a substantial base to operate and it is hard to get credit lines. We can’t tick the boxes that normal businesses can because we deal in creative output. “We will challenge government representatives to start developing a long term solution for the provision and support of independent cultural and social enterprises,” she said. Our end goal is to find a permanent home for the next 20 to 30 years, but with no line of credit it is very hard to get these guarantees. Email “'The arts are victims of Dublin's economic recovery': Block T is forced to relocate”. 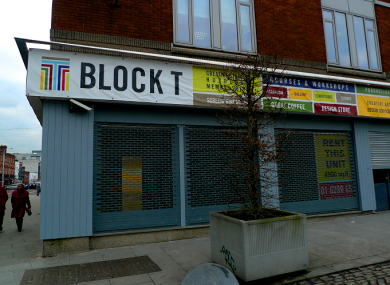 Feedback on “'The arts are victims of Dublin's economic recovery': Block T is forced to relocate”.